Filters on Instagram are kind of a big deal. People on Instagram use filters for many different reasons. And different filters Eave different purposes. From helping you highlight special features in your image – to making your picture look vintage. Or, simply giving your photo a completely unique and appealing look. The filter Clarendon is the single most popular filter in the world. Followed closely behind are Juno, Valencia, and Gingham. When choosing a filter to use, you want to consider the purpose of the filter and what you’re going to use it for. Different filters have different personalities, and will grant you more or less likes depending on how well you match the filter with the post you share. Filters are a huge part of Instagram as a social platform dedicated to visual content, and they are there to be used. If you use filters correctly, they have shown to be able to give you a huge upswing in the engagement you receive on your post. But before you can do that, you need to understand what filters exist, and how you can use them. How are Instagram filters made? Instagram hasn’t explicitly announced or explained how they make their filters, however, the founder of Instagram, Kevin Systrom has explained a few times on Quora to explain how they come up with and develop filters. How many filters are there? At the moment, there are 40 filters on Instagram. But there’s a big chance that there will be more. Instagram regularly adds new filters, and this makes it more difficult to keep track of which filters are best for which image. What’s more, many people don’t even know of all the filters that exist on Instagram. The reason is that by default, only a part of the filters are presented in your “filter slider” when you are uploading a photo. If you want access to all, you need to go to filter settings and manage your hashtags. In the filter manager, you can remove filters from your list of visible filters, and you can also add filters that you want to use. To manage your filters, select a photo to post just like you normally do. After that, swipe to the very right in the list of filters you have presented. At the end of your filters, there will be a square box just like the shape the filters have. The box will say “Manage”. Tap it. Here you’ll be presented with a complete list of all the filters that are available. Click the checkbox for the filters you want to include and de-check the filters you want to remove from your quick-access list of filters. Adding a filter to your post is super easy. When you have taken a photo or recorded a video, you can edit it by using a filter. To add a filter, tap on the filter you want to use after you’ve selected the photo/video to post. The filters will be located at the bottom of the screen. If you want to change the strength of the filter, tap on the filter you selected again. When you’re pleased with the outcome, tap the “Next” button in the top-right corner and share your post. 1. 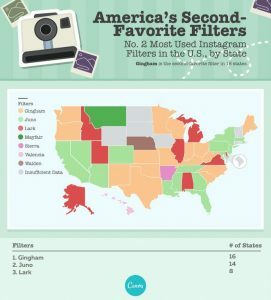 The number one most popular filter in the United States is Clarendon. And it doesn’t really come as a surprise because it is the default filter on Instagram. The world’s most popular filter on Instagram is Clarendon. 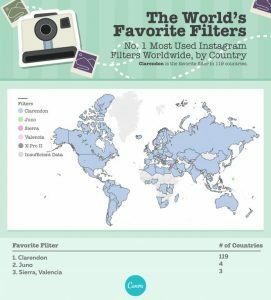 It is the most popular filter in 119 countries, which is the vast majority of the world’s countries and population. 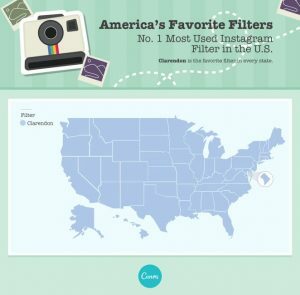 According to a study led by Canva, Clarendon is the most popular filter all of North and South America, Europe, Russia, Asia, and Australia, as well as much of Africa. Clarendon is the top most popular filter in the world, and it is also ranked as the number one filter for food photos. Clarendon is a filter for Instagram that intensifies shadows and highlights creating more contrasted images. The filter makes colors stand out, which makes it the perfect filter for sunset photos. The reason why it is the most used filter, apart from the reason that it is a default filter is that it is an all-around filter that makes the image pop. The name of the filter reveals itself. This filter de-saturates photos and add a mask of yellow and soft tones which make the image look dreamy and hazy. This filter is especially good for nature and street photography. The filter adds a retro look and quality to your photos which makes the name for it very suitable. Lark is a filter ideal for landscapes and nature shots since it increases blues and greens whilst de-saturating the red tones in your image. The Lark filter is also great for portraits as it helps give a “model” look. In other words, the filter intensifies and brightens colors except for red hue. The filter makes the image look warmer which also makes it great for portraits. This filter makes your photos look ‘dusty’, resulting in a vintage feel. If you want to make your post look old and the colors in your photo to look washed out, this is the filter to opt for. It desaturates your image and brightens it up to replicate old photos. It is especially good for portraits since it hides blemishes in the skin. Juno is the ideal filter for people. It intensifies red and yellow hues in your pictures, making them pop more from the blue. The filter makes the green in your photo greener, cools the blues, warms up skin tones and warms up and gives skin tones a glowy look. The filter also helps add more depth to your photo, making it more alive. You’ve probably already thought of it, but this is the perfect filter for selfies and portraits. Ludwig is a great all-around filter that distributes light and dark in the right places. It enhances the colors and highlights in your photos and intensifies the warmest colors. Ludwig is great for portraits, selfies, sunsets, and architecture. Aden is a low-contrast filter that desaturates your image while also decreasing the contrast – making it a “pastel filter”. This filter is perfect for portraits and selfies as it hides any blemishes in skin tones and makes your skin look smooth. This filter warms cooler images and improves warm tones. It is the perfect filter for colors found during autumn. Perpetua is the ultimate nature filter since it enhances colors found in nature such as green and blue. Perpetua also makes orange and red stand out.This filter is good for creating an edgy look for your city scenes and landscapes. This filter makes your skin look very unnatural, so using it for portraits or selfies is not ideal. It is, however, great for daylight shots – especially outdoors. It gives your photo an edgy look that is also great for landscapes and city shots. This filter adds more light to the center of your photo but doesn’t make the outskirts of your photo darker. However, the darker your image is, the bigger difference you’ll notice when using this filter. This filter makes your image look slightly aged. The Mayfair filter is a discrete filter that makes the overall look of your image better. It warms up the photos, putting a “spotlight” in the center of the image, as well as adding subtle vignetting around the corners. It uses warm pink tones and subtle vignetting to make photos you take during the daytime pop. This filter is perfect for either bright or underexposed image. The Rise filter adds a soft, warm glow to your image by softening the lightning on the subject. This filter makes skin look soft and smooth, and is therefore perfect for portraits. Th Hudson filter has the personality of making your pictures look cold by adding a blueish hue. It makes it look like you took the photo on a cold day, but it is perfect for making things look modern, or to photograph things that are modern. Architecture and sleek shapes, such as cities are things that are perfect for this filter. This filter adds a yellow hue to your image, making it look vintage, and classic, like an old movie or photo. This filter saturates blue and orange, and if you have those colors in your photo, this filter might be for you. The colors will be brightened a slight notch. It is great for nature photos. In fact, it is the most popular filter for nature photos. The filter warms up the whole photo and makes it look old-school. This filter makes the colors in your image pop by making them more saturated, more warm, and vibrant. It makes them warmer and more vibrant. This is a great one to use when you have a lot of colors in your photo. This is the ultimate filter when you have a photo that includes a lot of colors. It increases the contrast and adds a strong vignette. It adds shadows and increases the darkness of your photo’s dark elements. This filter is best used for bright daytime photos. it is not ideal for portrait photos as the contrast of the skin can look weird. The Nashville filter is perfect if you want to make your photo look old-school. It brightens your photo and uses a slight pink tink to it. It makes your filter look warm and welcoming. This filter is very similar to the Lo-Fi filter which means that it is a bright filter that increases the saturation of the colors and adds a touch of vignetting while warming up your image.This filter is perfect for photos with lots of color such as nature photos. This filter makes images look metallic. It is a filter that increases both contrast and exposure which gives your photos a yellowish tint. If your photo has strong shadows or contrasts, this is a filter you can use. The filter desaturates your images but still let bright colors come through. It is the ultimate hipster filter that makes your images look very old. The Lo-Fi filter increases color saturation and makes the shadows in your image appear stronger. This filter is great for practically any type of photo which makes it a great all-around filter. This is a monochrome filter that is a mixture of black-and-white sepia. It adds subtle purple tones to your images. It makes your photo soft and creates a slight vignette around the edge of your photo. This is a perfect filter for portraits and landscapes. The black and white hides any flaws or blemishes in your selfie, making Willow the ultimate selfie filter for the person who is still a bit camera-shy. This filter will soften your image and make it look faded. It is great for nature and landscape shots since it adds a calm feeling to your photo. With its orange and tile touch, the Helena Instagram filter gives to your pictures and images the classic look of the current Hollywood movies. It is perfect for outdoors and when you want to add warmth and coziness to your pictures. This is the most popular fashion filter. It makes sunlight more golden and intense and is perfect if you want to highlight the sunlight in your photo. This filter intensifies red and yellow hues in images. It also increases the yellow and orange. This filter is great for creating a depth in your image. It intensifies colors and brightens warm hues. This filter gives darker pictures a yellow tone and makes regular and brighter pictures look vintage and dreamy. This filter is popular among people who share images of fashion that want to add a vintage touch to their images. Charmes is a high contrast filter that warms up colors in your image with a red tint. This filter is great for dimly lit images and city shots. Ashby gives your images a golden glow and subtle vintage feel. It does this without increasing the shadows in your image. This filter is great for portraits or if you want to add a vintage feel to your image. The Dogpatch filter increases the contrast in your image while washing out the lighter colors. As per Instagram’s suggestion, you should use this filter to give your photo a dramatic look. This filter works best for bright images but doesn’t work well with dark images. As the name suggests, Skyline is great for just that: skylines. It brightens your image and gives it a nice pop. It is great for virtually any image that you want to increase the brightness of. This is just like Skyline, a filter that adds brightness and a warm glow to your images. It is great for outdoor photos, portraits, and city shots. This filter darkens your images, increases shadows and adds a yellow tint to them. This filter works great for photos of architecture. For portraits, this filter is not ideal because it adds shadows to your images. Vesper is the ultimate filter for portraits and selfies. It smooths out skin tones and adds a yellow tint, which gives your photo a vintage feel. Stinson is a discreet and subtle Instagram filter that only brightens your image and washes out colors a tiny notch. This filter is great for portraits or images that need a boost in brightness. This filter adds brightness to the center of your image while also adding a blue tint to the image’s colors. This filter is great for portraits but it can also be used for well-lit images since it then gives them a vintage look. The name gives this filter away and tells us that it is a vintage-inspired filter, and that is exactly what it is. 1977 gives your image a faded look while adding a red tint to it.This filter is great if you want to give your image an old-school look. If you’re a kid from the eighties, you’ll love this filter adds a dodged center to your image with a red tint and a burnt edge. In other words, the filter toasts your image. It is a great filter to use for photos taken during the day, and it is not that great for photos taken during the night. In other words, dark images. Sutro adds a highly noticeable vignette, while also darkening your image and giving it a smooth look. This filter focuses especially on purple and brown colors and gives the images a smoked look, putting a particular emphasis on purple and brown colors to achieve this effect. Sutro is a great filter for basically anything except portraits. This filter is named after a dog belonging to one of the people in the Instagram team. This filter adds intense shadows and highlights contrasts. It is best used for giving your image a vintage look. It is also a popular option for selfies and portraits. You can explain Moon as a white version of Gingham. There’s no denying that Instagram has a lot of filters and that it is hard to decide which to use. When you’re standing there, ready to upload, and then come to the filters, it’s easy to get caught up for a long time because it is so hard to choose. Hopefully, with this article, you now know a little bit more about the filters on Instagram and how you can use them. Have any questions about Instagram filters? Don’t hesitate to ask them below and I’ll gladly answer! 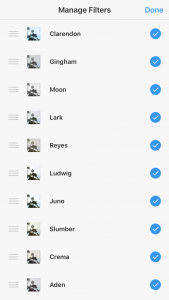 NextCan you Change Filter on Instagram After Posting?